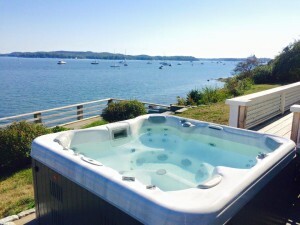 The Saratoga’s Luxury line of hot tub spas has consistently rated one of the best in the market. We’ve stood behind this line for over 20 years and they continue to impress both us and our growing list of relaxed and satisfied customers. Saratoga’s Luxury line has all the features you’d expect to find in a high end spa as well as some unexpected surprises. With Saratoga’s Roto-Stream Valve and Versa Flo valve system, you adjust the water flow to fit your comfort level. The Whisper Clean System combines Microban filtration with Ozone injection and delivers the purified water back to the spa with a simple 35 GPM circulation pump. The energy efficient pump is extremely quiet, yet it circulates over 50,000 gallons of water every 24 hours to give you superior water clarity. To add to the energy efficiency of these spas they all have full foam insulation, key to any high end spa. The Saratoga Luxury Spa line comes with a 7-year warranty on the shell and a 5-year warranty on all plumbing, pumps, heaters and controls.